Whether you send frequent or infrequent business or family emails to multiple people, then MailMergeApp is perfect for you. It will help you send emails using your favorite email application and automatically insert information like customer name, phone number, or any other info you store in your Mac OS X Address Book. 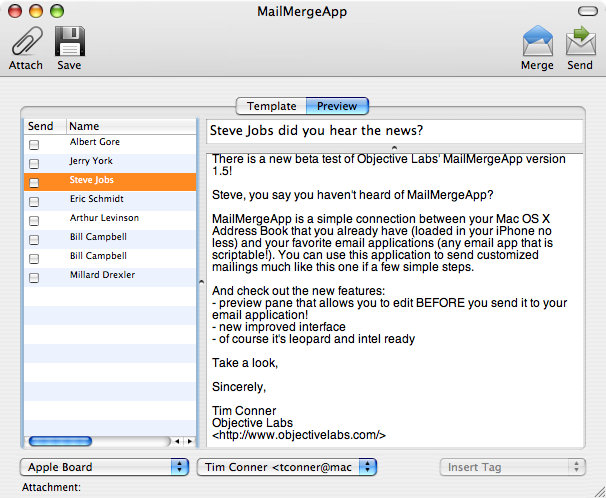 Purchase MailMergeApp for the low price of $10.00. Clicking the Buy Now button below will add this item to your PayPal shopping cart. Your serial number will be emailed to you. Remember you can always write your own plugin if your email client is not supported! To find out what this great little program can do for your mass emails, follow this link to add simple sophistication to your mailings. 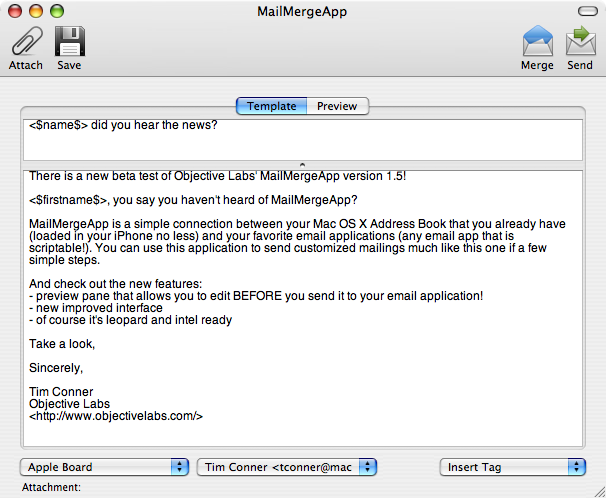 "If you have a weblog and use OS X, you owe it to yourself to check this app out. You won't find a more useful blogging app at a better price. (really!)" "Cool. I'm finally on OSX so I can try out BlogApp. Gorgeous." "Well, it's official. The absolute coolest thing on earth is no longer the powdered chocolate-cream donut (which, it must be said, held the title for an admirable run). The coolest thing on earth is now BlogScript, which I can already tell is going to become my bestest friend." "Very cool. I downloaded it and had it configured and running within a minute." "The best enhancement I've found for Blogger. The ability to modify tempaltes and archive templates without logging intot he Blogger website saves time and effort. Edit recent posts is a great adddition. It has worked flawlessly on Blogger for me. The best six bucks I've spent in a long time."